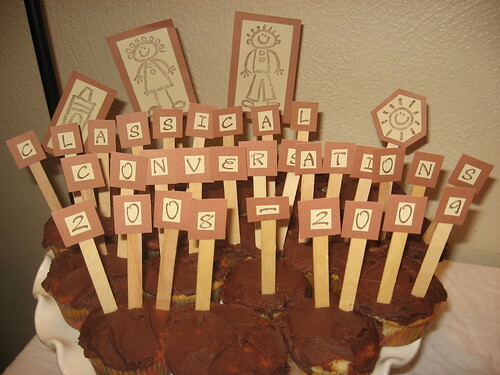 Until next year…that's a wrap on Classical Conversations, St. Louis Style 2008-2009. You all saw my "To Do" list yesterday. It wasn't pretty, but sadly, that's what my days tend to be like more often than not. I just don't write all the stuff down like that so even I don't know how truly goofy the day is, I just know I'm exhausted by the end of it all. I made it to Starbucks today. Check! I decided not to make the bread (really, I have no idea when I would have done it), so I just need to swing by the store and get some before the banquet tonight. Nice that the store is within walking distance of the church. One of the families in our group thought it would be fun to make a slide-show for tonight, so they took care of that. We ran into a snag today, though, when we couldn't find the projector screen anywhere. Craig came in to rescue us by asking to borrow one from the school. What a relief! I went to the church early to prepare the room and such. I thought I'd be there about three hours and be done, but because I had to shuffle kids back for piano lessons and also squeeze in Starbucks and Trader Joe's for flowers, my three hours actually turned into about five. But it's done now. I'm home resting, but really needing to clean the downstairs. This poor house sure takes a beating when I'm stretched in a gazillion different directions. Which is most of the time. I need to think on that some more because I need to figure out how to make this house more of a priority of my time. Anyway, the party should be fun tonight. The kids are excited and I think they will be honored by the time. The food will be good and plenty. Conversation should be easy. Clean-up, though, that could be a bit of a bear. Good thing tomorrow is Saturday.